Liverpool left it very late, but a Toby Alderweireld own goal saw them secure a priceless 2-1 win over Tottenham as they return to the Premier League‘s summit. 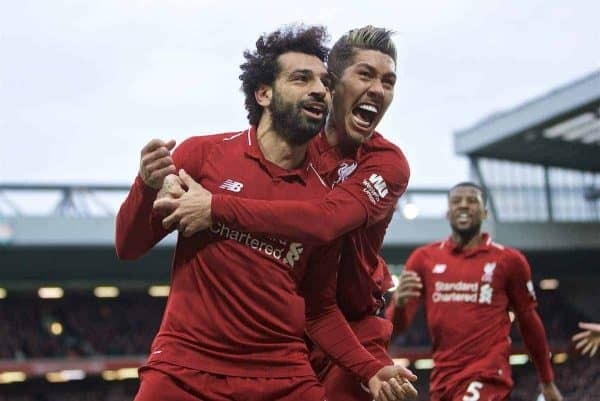 After a two-week for the final round of internationals this season, the Reds returned to Anfield for a clash that could have big sway in the title race. Speaking before the game, Jurgen Klopp embraced it being “the only period in the whole season without any interruptions,” with the focus now solely on the Premier League and Champions League. Spurs presented tough opposition, and Klopp made two changes to the side that battled to a 2-1 win at Fulham a fortnight previous, with Jordan Henderson and James Milner coming in for Fabinho and Adam Lallana. After Man City‘s 2-0 win on the same ground on Saturday victory was paramount for Liverpool, and a stroke of luck ensured just that. An impressive atmosphere welcomed the two sides on the pitch, with the anticipation of a first title since 1990 growing despite City returning to the top of the table earlier in the weekend. Spurs looked to go direct and central early on, and the wind caused problems for both Joel Matip and Alisson, but Liverpool’s alternate approach, out wide, paid dividends just after the quarter-hour mark. First blood came through an inch-perfect Andy Robertson cross, who laid on a great header for Roberto Firmino to break the deadlock—his ninth assist in the league, and 11th in all competitions. 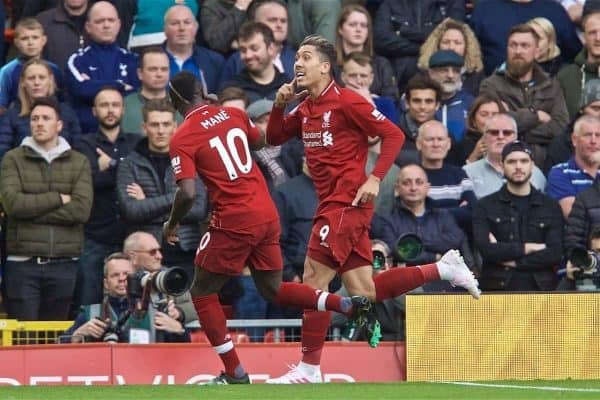 Firmino was the dictator throughout in a brilliant first-half display, and his incisive pass almost allowed Sadio Mane to score his 12th goal in as many games, but his curler edged just wide. 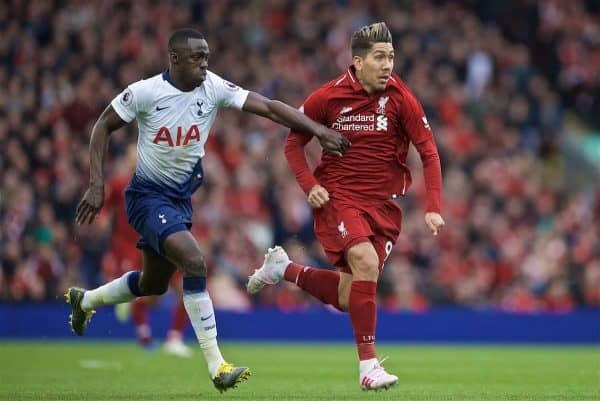 Tottenham opted to change shape to contain Liverpool as the half went on, and it led to a decrease in chances, but Klopp would have been happy going into the break at 1-0. Spurs switched system again after half-time, with Jan Vertonghen moving to left-back and Danny Rose pushing forward to give the visitors at back four and provide a different challenge for the Reds. Harry Kane had a rare chance on 56 minutes but he blasted his shot at Alisson, whose save fell into the path of Christian Eriksen, only for Robertson to make a vital block. Liverpool found themselves in a brilliant position on the counter soon after as Mohamed Salah charged forward, but the Egyptian failed to find the pass to Mane and instead wasted the chance with a poor attempt. At the other end, a smart free-kick from Kane found Spurs in a great position in the box, and despite a fumbled pass from Eriksen, Lucas Moura was on hand to equalise. Klopp responded with two welcome changes as both Henderson and Milner came off to be replaced Fabinho and Divock Origi, as Liverpool switched to a 4-2-3-1 formation as Salah moved up front. Ultimately it came down to a set-piece, and then a brilliant cross from Trent Alexander-Arnold, that saw Salah’s header palmed out by Hugo Lloris and back into goal by Alderweireld for an incredible victory.